Choose to take the first 3 days as a Mediation Certificate; the last 2 days as WFA Certification; or choose both for the entire workshop. Co-sponsored with ADRIA, Calgary, Alberta. May 2, 3, 4 and 6, 7 – 2019 ADRIA hosted us in Edmonton in November 2018 and couldn’t get enough. We return to Calgary this time with our popular offering of innovative solutions to workplace conflict. Co-sponsored with ADRIO, Toronto, Ontario. June 17-21 – 2019 Join us for this popular seminar that is being offered across Canada. You will learn how to restore workplace relationships and build stronger conflict management systems. One student writes: “The event was well organized and both facilitators were excellent. The atmosphere was lively and engaging. Both speakers were incredibly knowledgeable and did extremely well educating the participants while encouraging participation and interaction throughout…I have attended workshops where I left feeling exhausted because I was not made to feel entirely comfortable, but this was not the case with Blaine and Marjorie. I would attend any of their future offerings in a heartbeat! Here we will explore the following mediation options: employment mediation – i.e. mediation of common law wrongful dismissal claims grievance mediation – the process used as a diversion from arbitration in unionized work environments workplace interpersonal mediation – including two-party mediation and conflict management coaching collective bargaining facilitation and mediation workplace restorations Most of this day will use group discussion as the pedagogical methodology. We will also provide demonstrations and roleplays to highlight the differences between these options. We will introduce a Mediation Approaches Model that accounts for the stark differences in these options. This day will be focused on evaluative models for understanding workplace structure. We will introduce the Psychological Health and Safety Standard and explore its potential use as an evaluative model for workplace health. We will also introduce WFI’s Testing Instrument for Fairness Systems and its use to help evaluate the strength of conflict management systems. In the afternoon we will explore methodologies for gaining organizational buy-in to the use of these tools. We will consider power relationships in each subject organization and strategize on how best to achieve commitment to change. Two Day Certification: $1000 + Tax Three Day Workplace Restoration: $1500 + Tax Five Day Combined Session: $2450 + Tax There is an additional $200 +HST one time certification fee for those seeking to become registered as “Workplace Fairness Analysts” with the Workplace Fairness Institute. 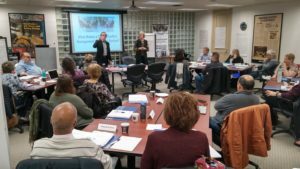 Large organizations like the City of Calgary, Canada Revenue Agency and the Department of National Defense have contracted us to provide this seminar as an in-service training for their practitioners. We work with the client to modify the training to suit their specific needs. The cost of running this seminar in-service is considerably less. We charge $3000 + tax per training day for groups of 12 or less and $4500 + tax per training day for groups of 13 or more. Respect Group in conjunction with the Workplace Fairness Institute are proud to offer specialized training sessions aimed at Keeping Respect Alive. These seminars will enhance the foundational knowledge contained in the Respect Certification online training video. We use Respect Certification as a way of adding a common language and understanding to the dialogue of Respectful Workplaces. After having attained Respect Certification, employees will then participate in a seminar that is designed to open up dialogue about how they see Respect in the Workplace and how best to support each other in maintaining respect in their working lives. As a part of principle of client-centered process design, we will work with you to tailor our seminar offerings to your specific needs. We will sit down with your leadership to discuss the specific challenges and opportunities posed by your workplace culture. From here we will develop either a 3 hour or 6 hour training session. We firmly believe that the best training that can be provided in Respectful Workplaces will come from the participants themselves: their experiences, their discussions and positive support of each other. Our expert facilitators will guide the dialogue toward an understanding of what Respect means and how Respect is accomplished. Our agenda consists entirely of group exercises and reporting the main seminar. This maximizes participant involvement in the training itself making it entirely interactive. • The One-Thing Exercise: where we have participants name one thing they can personally do to enhance respect in the workplace and one thing they need from others to make them feel respected. This helps to personalize our understanding of the impact of lack of respect in the workplace and requires participants to take personal responsibility for their part in the enhancement of the culture of respect. • The Corn Exercise: where we ask participants to get in groups and tell us what they think Corn is: a fruit, vegetable, grass or grain. They work in groups to put their arguments together and present to the rest of the participants. This is designed to show how groups and cliques form in the workplace and how negative attributions arise. This has been very successful in explaining how Attribution Theory and Conflict Transformation Theory work. We have numerous other exercises that are used to help facilitate dialogue about respect in the workplace. The best way to enhance respect in the workplace is to allow workplace participants to come to a consensus about how they are going to treat each other. We call this consensus a Respectful Workplace Charter. This is a Charter that will be developed by workplace participants and signed by them as their commitment to Respect in the Workplace. • What does Respect look like to us? • How do we support each other in encouraging respectful behaviour? • What do we do when we witness disrespectful behaviour? • How do we support someone whom we believe is a victim of disrespectful behaviour? • How do we have a supportive conversation with someone who we feel is being disrespectful? There are numerous other questions that could be asked in this regard. The facilitators will work with the leadership to help tailor the questions to their specific workplace culture. For the last hour of the day, we will create the charter on a document that will be reviewed and signed by each participant. This document will form a part of their commitment to a Respectful Workplace.